Home > Seafood Appetizers > Awesome Shrimp! > Baked Stuffed Jumbo Shrimp! These are Handmade "Jumbo" Stuffed Shrimp! Made with Captain Tim's Own Scallop Seafood Stuffing! These are really Delicious Shrimp! Seafood Entrees • Atlantic Salmon Fillets • Classic Baked Stuffed Flounder! • Hand Cut Swordfish Steaks! 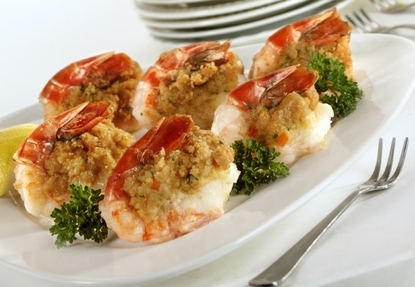 Our Stuffed Shrimp Are Made With Our Fantastic Seafood Stuffing And Are Ready To Bake And Enjoy! They Are So Good, You'll call us for the recipe! A Great Gift Idea, for Holidays, Anniversaries, Birthdays or Corporate Gift Idea!! Order these Awesome Stuffed Shrimp By 10am EST, And Enjoy Them For Dinner Tomorrow!Our Seafood Stuffed Shrimp Also Make A Great Gift Idea For Your Favorite Seafood Lover! How Easy Is That! 4 Pack Of 1 1/2 pound lobsters! I ordered lobster tails for Our New Years Eve Dinner and ordered these stuffed shrimp at the same time. We loved the lobster - best ever. Tonight we had the stuffed shrimp. So good. My husband says we need to get more. We will definitely be ordering more lobster tails and stuffed shrimp. Excellent stuffed shrimp! really good. The last time I had shrimp like these was when I vacationed to Maine five years ago! Talk about five years too long!! I will be ordering again very, very soon! Thanks Cap't Tim! The lobsters as always was a huge success with our friends from San Francisco. And they loved the baked stuff shrimp. It's the recipe that I remember as a child growing up! Dad would take us to Twin Oaks Restaurant and other summer restaurants at the beaches. It brings back great memories. Thanks again for great customer service and delicious products. May the force of lobsters be with you. We ordered these for Thanksgiving dinner. Excellent Excellent Excellent! Tasty and sweet! Great stuffed shrimp like back home! My husband LOVED these shrimp! He said they were as good if not better than anything he has ordered in a restaurant. We will order again. Helen P.
I added these stuffed shrimp onto my regular lobster order from Capt. Timmy. These were AWESOME! That stuffing is incredible! We ran out but I can fix that, I'll order more! 2 thumbs up Captain!